The main focus of attention in the Mayo Senior Football Championship was in group four on Saturday evening. Both Breaffy and Ballintubber went into the final group game level on points after their draw in Clogher in the previous round. Ballintubber held a slim one point advantage on the scoring difference charts over the local rivals and it was to come down to the scoring difference to sort out the placings at the end of play. It was the men from Clogher who ended up topping the table thanks to their 2-18 to 0-5 win over Kiltane, while Breaffy saw off Davitts 0-17 to 0-5 in Claremorris. That left Kevin Johnson’s men with a scoring difference of +23 to Breaffy’s + 15. While Breaffy were expected to see off Davitts with ease, which they did running out 0-17 to 0-5 winners; Ballintubber were expected to get a much tougher examination from Kiltane in MacHale Park. But the West Mayo men were in a different class to their north Mayo opponents running out 2-18 to 0-5 winners in a canter. 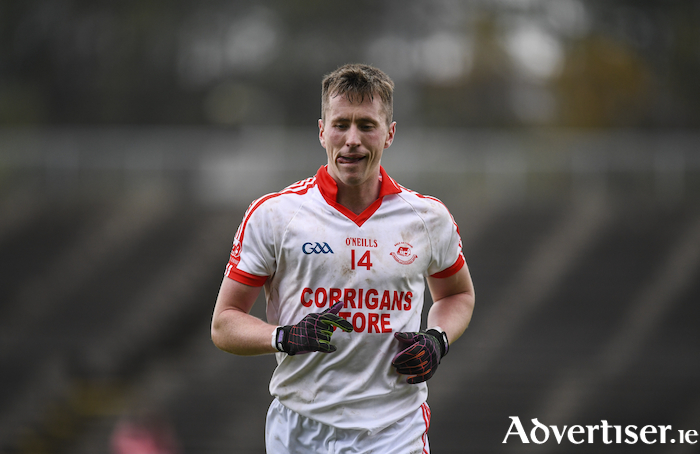 Goals in either half from Alan Plunkett and Ciaran Galvin, combined with eight points from Cillian O’Connor and four points from the very impressive Stephen O’Malley - saw the Tubber home at their ease. Castlebar Mitchels wrapped up top spot in group one thanks to a nine point win over Ballaghaderreen. The defending county champions ran out 3-12 to 0-12 winners in Charlestown on Saturday evening. They led by 1-8 to 0-7 at the break and outscored their opponents 2-4 to 0-5 over the final 30 minutes to book their spot as a seeded side when the draw for the quarter final is made. Both sides had already progressed to the last eight of the competition before this meeting, leaving Aghamore and Ballina Stephenites to battle it out to avoid the relegation play-off when they meet on Sunday afternoon at 4pm in Foxford. There was no action in group two on Saturday evening with the two games in that group taking place on Sunday at 1pm. As the table currently stands Garrymore are already through and on top with four points thanks to their two wins - having seen off both Charlestown and Knockmore. In second place at the moment is Charlestown Sarsfields thanks to their win over Knockmore in round one. Moy Davitts and Knockmore are tied on one point each - the two sides drew with each other in the last round, after losing to Garrymore and Charlestown respectively in round one. The action on Sunday pits Charlestown against Moy Davitts in Kiltimagh and Knockmore against Garrymore in MacHale Park at 1pm. In group three the action on Saturday evening was between Hollymount-Carramore and Crossmolina Deel Rovers. There was nothing to separate the sides at the end with the game finishing in a 1-14 to 0-17 draw - with the Deel Rovers kicking the last three points of the day to tie the contest up. Alas for the north Mayo men it was not enough to keep them out of relegation trouble as the ended up finishing bottom of the group on scoring difference by 12 points. The second game in the group takes place on Sunday where Claremorris and Westport - who are both already through face off in Ballinrobe at 2pm, with top spot in the group and seeded quarter-final up for grabs. In the intermediate championship group one came to a conclusion in dramatic style - with Belmullet seeing off the favourites for the title Kiltimagh in Ballina on a scoreline of 1-14 to 2-8. Half-a-dozen points from Johnny Donoghue along with 1-1 from the boot of Shane Nallen and three points from Ryan O’Donoghue was the bedrock of this win. The north Mayo men tailed 0-7 to 1-5 at the break, but they outscored Kiltimagh 1-7 to 1-3 after the turn around to seal top spot. At the bottom of the table Ballyhaunis ensured that they will be playing intermediate football next year after a comprehensive 1-16 to 0-8 win over Mayo Gaels in Davitts. The victors led 1-9 to 0-4 at the half time whistle, with the goal coming from Keith Higgins just four minutes into the contest and the proved right from the get-go to have to much for Mayo Gaels. In group two, both games will take place on Sunday afternoon - but we know that thanks to Burrishoole’s last gasp win over Islandeady on Wednesday night the two teams going into the last eight with Swinford also going through alongside Colm McManamon’s charges. The aforementioned pair will meet on Sunday afternoon in Parke at 2pm to decide whose going to top the group. There’s much more riding on the meeting of Islandeady and Bonniconlon in the other group game with losers heading for the relegation play-off. They will square off in Ballina at 2pm. The Neale put on a top class display in MacHale Park to pick up the win they required to ensure they topped group three. The saw off Ardnaree by eight points on a score of 1-16 to 1-8, but in truth it was an eight point hammering. Patrick HopKins and Padraig Walsh kicked five points each, while Oisin Connolly bagged the goal with Killian McHugh putting in a great performance landing two points and covering acres of ground all evening. In the other game in the group Ballinrobe saw of Castlebar Mitchels second string on a scoreline of 2-14 to 0-9 in Clogher to book their last eight spot as they look to bounce straight back up after relegation last year. That defeat also sends Mitchels into the relegation play-offs giving them at worst two more chances to stay in the intermediate grade. In group four, both games will throw-in at 2.30pm on Sunday with Louisburgh and Lahardane meeting in Breaffy and Parke and Shrule-Glencorrib going head to head in MacHale Park. At the moment Louisburgh lead the group on four points thanks to wins over Parke and Shurle-Glencorrib, with Parke and Lahardane level on two points each. Parke hold the advantage at the minute on head-to-head, thanks to their win over John Maughan’s men in round two and Shrule-Glencorrib sit at the bottom of the table with no points from their opening two games. But it could all come down to points difference depending on how results go, with a number of combinations of sides potentially making it into the last eight.